If you are new to cloth diapering all the cloth diapering lingo can be very confusing. Here is a small glossary of cloth diapering terms and common acronyms with their meanings. AIO- All-In-One cloth diaper. This option is the closest to disposables and consists of a waterproof layer with absorbency sewn together. No cover is needed. AI2- Similar to the AIO but the absorbent layer is an insert that lays inside the diaper. No extra cover is needed. Aplix- (hook and loop) - A way to fasten diapers, similar to Velcro but known to be longer lasting. Contour- Contour diapers are shaped diapers that may or may not include a liner for extra absorbency. Generally contour diapers do not have elastic or closures and will need a waterproof cover paired with them. Fitted- A shaped diaper made of absorbent material with elasticized legs and usually snap or aplix closure. A waterproof cover is needed. Flat- Single-ply cloth that is folded to create diaper. Requires pins or snappi and a waterproof cover. Hybrid- A waterproof shell paired with an absorbent insert. Pre-Fitted- A fitted diaper that has been made from a prefold. A waterproof cover is needed. Prefold (PF)- A flat, layered, rectangular diaper with extra layers for absorbency in the center. Requires pins or a snappi and a waterproof cover if needed to be leakproof. Pocket Diapers- A 2 layered diaper that requires the addition of an absorbent insert. The outer layer is most commonly made of PUL, with the inner (the part that sits against baby's skin) usually being a "stay-dry" fabric (microfleece, suedecloth, etc.) that allows moisture to seep through to the insert, keeping baby's skin dry. Use a fresh, clean insert and pocket at each change. You do NOT need a cover to make this type of diaper waterproof. PUL- Polyurethane Laminant - a common waterproofing material in diapers. Snappi- An alternative method to fasten diapers. Stripping- A method of washing diapers to ensure any build up of soap or oils are "stripped" from the cloth, thus reviving the cloth's absorbency. WIO- Wool -in -one - and AIO made with a wool outter as the waterproof element. Wool Soaker- Wool naturally repels water and is commonly used as a diaper cover. Wool requires special care. Also called woolies. Does your blog feature cloth diapers as well? 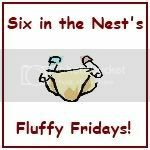 If so, post my Fluffy Friday button on your blog and link up to my this posts (must link to a cloth diaper/accessory giveaway or post about cloth diapering)!